I’d bet a lot of money that when you first started blogging, the words “media kit” never crossed your mind. It’s not what any of us naturally think about when envisioning our brand new blog. We’re focused on sharing our passion with others. And the rest of the internet isn’t helping—media kits aren’t included on any of those handy lists of what to do when you’re first starting to blog. First things first—what is a media kit? Before blogs were around, newspapers and magazines used media kits to outline their target audience and advertising options to potential buyers. They haven’t changed much: a media kit is basically a resume for your blog. It includes important information about your blogging focus, traffic numbers, services available to clients and contact information. Media kits are absolutely essential to growing your blog from a side project into a possible revenue source. Whether you’re looking to have banner ads, sponsored posts or giveaways, you will need to have a media kit to present to potential clients. It doesn’t matter if you have 100 or 1 million visitors—you still need to have a media kit available if you want to monetize your blog. Potential clients need them to help make the decisions to work with you. At previous companies, I did a lot of blogger outreach and having a media kit available made it much easier to sell my boss (the decision maker) on working with you. By giving me a media kit up front, you’ve just saved me a lot of time compiling your stats on my own and potentially pushed yourself to the top of the pile. While it does take time for you to create a quality media kit, it will give you a huge advantage against those who don’t when try to land brand partnerships. One page of information. Like a resume, a media kit should be a jumping-off point for your conversation with brands, not necessarily a self-biography. You want to strike that balance of giving enough information away to help the client make a decision, but also have them come back for more to ask questions. A quick introduction. Describe who you are and what you blog about. Be direct, specific and honest about yourself and your blog. What is your background? What topics do you write about? This is a chance to celebrate the individuality of your blog, not recite the latest blogging buzzwords. Your relationship history. Have you already worked with fabulous brands? List it loud and proud. Potential clients will want to know if your past relationships align with their brand or if you’ve previously worked with a competitor. Your blog traffic. Though it may feel like you’re streaking across a football field in front of the world, you should be sure to include traffic numbers like pageviews, time on site, and unique visitors. Tip for those without a ton of traffic: include the percentage of returning users to show how engaged your community is. Community engagement outweighs raw pageviews in the business world because your readers will be much more likely to act on your post (which is the client’s ultimate goal). Your social media followers. Don’t make potential clients hunt for your social media numbers–put them all in one place. Be sure to include only the networks you are active on to put your best foot forward. For example, if you set up a Pinterest account but never use it, don’t put it in your media kit. A print-friendly design. Not every client will be comfortable viewing your media kit on his or her computer. At previous positions, I had to print out media kits to put them in a binder for the office. There was nothing worse than having a gorgeous media kit look great online only for it to print as one smudgy blob on paper. Again, something like this could be a deal breaker to some clients. A final version available in a PDF. Often, Word documents lose formatting on others’ computers. Make sure that the design and layout you’ve worked hard to create looks the same no matter which computer it’s viewed on. How should I make one? Get your analytics straight. One of the biggest selling points of your media kit is the traffic and community you’ve worked so hard to build. If you don’t feel like jumping into a data jungle, Shareaholic Analytics can help you grab most of the numbers. Design your own media kit with PowerPoint. PowerPoint is SUPER easy to use for design purposes, especially if you don’t have Adobe products on hand, and it’s easy to export to a PDF. (We even created our latest ebook with it!) If you’re not good at design, make sure you get another pair of eyeballs on it before putting it up on your blog to help you cross all of your t’s and dotted your i’s. Or… you could just get our free template below and have the design component already finished! Create a landing page for your blog. I’m a fan of keeping media kits out in the open and easy to download (as that’s made my job MUCH easier in the past), but if you’re not comfortable having your stats public, make sure it’s easy for people to contact you to ask you for one. No captchas or hoops to jump through—either provide an email address or a contact form directly on the page describing the media kit. Once you’ve gotten the media kit together and up on the blog, don’t forget to keep it updated! Like your resume, media kits are always works in progress, so be sure to check back once a month to update your growing traffic numbers and client roster. If you’re looking to learn more about media kits, please take a look at one of our fabulous featured publishers, Katy Widrick. She is the Queen of Media Kits and a fantastic person to learn from. She even gave us a few pointers for this post! Check out her media kit guides here. Thanks Katy! Have you ever made a media kit before? 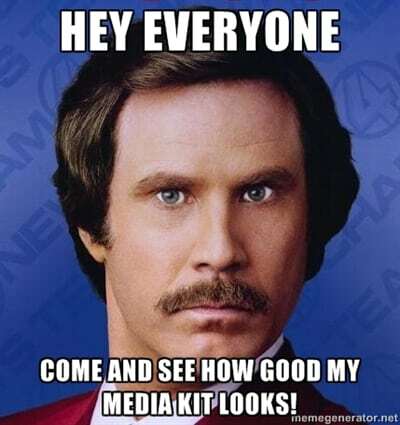 What are some things you would include in your media kit?